﻿ Real Madrid 2-0 San Lorenzo. World Champions, at last! 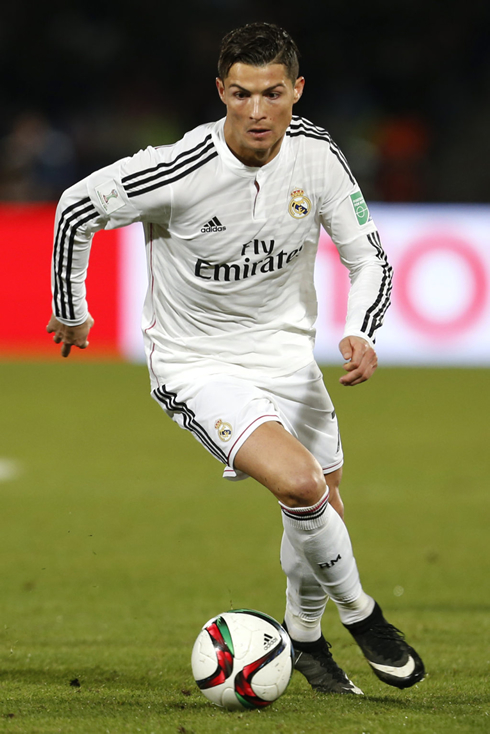 20.12.2014 » Real Madrid 2-0 San Lorenzo. World Champions, at last! Real Madrid have won their first FIFA Club World Cup trophy in the club's history, after coming on top of San Lorenzo this Saturday night in Marrakech, through a clear 2-0 win. Sergio Ramos broke the deadlock still in the first half and Gareth Bale would secure the Merengues' last trophy of 2014 with an early goal right after the break. Real Madrid have capped off one of the most impressive years in their long and storied history, by officially crowning themselves the best club team in the world in 2014, after a 2-0 victory over San Lorenzo. It wasn't the easiest match and the Copa Libertadores champions made it difficult at times for Carlo Ancelotti's side, but Madrid's quality would shine through in the end, en route to their 4th trophy this calendar year. The goals were delivered first by another Sergio Ramos header and later in the second half, Gareth Bale struck the final blow when he beat Torrico through a left-footed shot. The Real Madrid players will now go into a short holiday break, before they take on AC Milan in Dubai for a tournament friendly, on the 30th of December of 2014. It was a reintroduction into the starting lineup for James Rodriguez, after a brief injury lay off left the Colombian sidelined for the past couple weeks. San Lorenzo were aggressive early on, pressing well and chasing Real Madrid at every turn. They were equal parts annoying and antagonistic, begging for cards and coming in late on challenges. It was clear that the game plan was to make the big stars of Madrid uncomfortable early on. Still apart from a few brief scuffles, the Merengues held their composure well, weathering the early onslaught. They would be rewarded for their patience in the 37th minute, courtesy of non other than the 93rd minute-man Sergio Ramos, who rose majestically and connected with an expertly struck Toni Kroos corner, to make it 1-0 for Madrid. Like he did about six months ago in the UEFA Champions League, Ramos has again scored headers in the semifinals and finals of international club competitions. His impeccable timing again showcasing his penchant for the dramatic. Still, San Lorenzo would stand firm and continue to frustrate Real Madrid with their tenacious play, as both teams would go into half-time with the scoreline still at 1-0 in favor of Carlo Ancelotti's men. Real Madrid would seal the game early in the second half through another big game player, Gareth Bale, who's second half shot inside the box squirmed under San Lorenzo goalkeeper, Sebastian Torrico. Bale has now scored in three finals for Real Madrid. For the rest of the second half, Real Madrid would try in vain to put the game out of reach. San Lorenzo had a few long range opportunities, but they were easily handled by the newly confident and in form Iker Casillas. Cristiano Ronaldo would again have a frustrating game, for much of his time at the FIFA Club World Cup he just didn't seem to have much luck. But still, it was a magical night, capping a magical year for the reigning European champions. Real Madrid have now won 22 games in a row and added a FIFA Club World Cup trophy to their already impressive list of achievements in 2014: A Copa Del Rey, a UEFA Champions League and a European Super Cup. The whole team is clerly flying high at the moment and certainly hoping to replicate this success in 2015. Cristiano Ronaldo next game will be a friendly international against AC Milan, on the 30th of December. You can watch Juventus live stream, Real Madrid vs AC Milan, Athletic Bilbao vs Atletico Madrid, Newcastle vs Sunderland, Liverpool vs Arsenal, and Hertha Berlin vs Hoffenheim, all matches provided from our soccer streaming game pages.